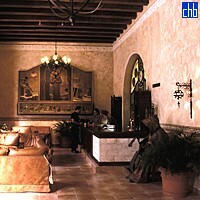 The Hotel los Frailes (Friars’ Hotel) owes its name to its proximity to the Basilica and Monastery of St Francis of Assisi in the nearby Plaza de San Francisco. It is a very pleasant little hotel despite a few idiosyncrasies, principal of which is that all the staff members are required to dress as Franciscan friars. It feels faintly sacrilegious to drink a mojito mixed by a monk, but no odder than seeing that same monk later, still in his habit, lurking outside the hotel entrance with a huge cigar between his teeth. 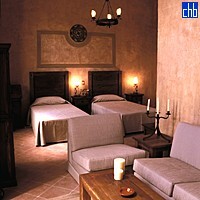 Another little peculiarity of the place is that the majority of the rooms have been laid out in the style of monastic cells. This actually sounds far worse than it is, for the rooms are air conditioned and so comfortable that one hardly notices the lack of a window. 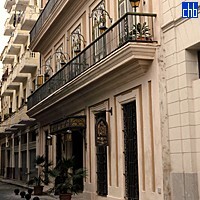 The first floor suites are definitely the best option, though, as they do have windows which overlook Teniente Rey Street; these rooms are thus very light and airy. The ground floor bar with its tall windows is cool and has lots of comfortable sofas, and the woodwind quartet that regularly plays there has a very soothing effect on the nerves after a day spent in the noise and heat of Old Havana. An interesting design feature of the hotel is that the original aljibe, the central limestone cistern of the type located under the courtyard of every colonial mansion in Old Havana, has been glassed over so that one can see the deliciously clear water below. Please note: Los Frailes has no restaurant, so its guests usually take breakfast in a corner café about a minute’s walk from the hotel.